I have two little boys that I adore. The other day I was thinking about what it would be like to have a little girl and the thought overwhelmed me. No, not the thought of cute little dresses, bows, ribbons, and a nursery. What overwhelmed me was the idea of having an emotional, high energy, flirtatious little girl and then dealing with that as a teenager. Ack. No thank you. I'll take more boys any day. So when my husband's brother had his second girl last month there weren't any pangs of jealousy. Instead I sent them the quilt that I made. The one I couldn't let go when they had their first daughter. (I made her this one instead.) Anyhow, seeing as I'm not counting on a girl, I figured it was time to let go. The hardest part of the quilt is cutting the edges. That took me forever. 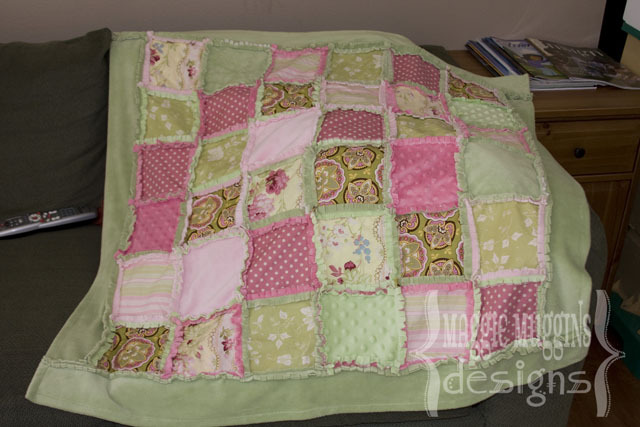 After I made this I learned that there are special spring action scissors for cutting rag quilts. They are in my cart right now! 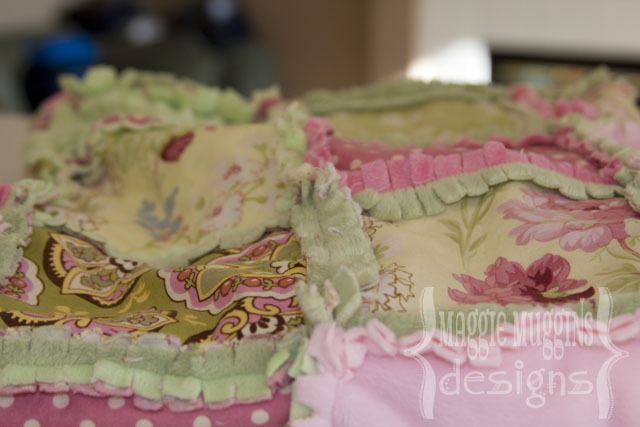 I'm not making another one of these quilts without them! I saw this pattern at a local fabric store that recently closed. It was an in-house pattern that cost $2. I had never made a rag quilt before and didn't realize how ridiculously easy it would be to figure out on my own. This style is a little different because it has a solid border around it and a finished edge. The pattern calls for 6 different cotton fabrics and 4 different Minkee fabrics. I used 5 cotton and Minkee fabrics. 1. Never put the same color next to each other. 2. Place them all on a table and then take a picture. It really helps to look at it that way to see if you really like it. It also helps when you're sewing it together days later and you can't remember how you've arranged your little piles. Trust me. 3. I put a few cotton pieces on the Minkee side and a few Minkee pieces on the cotton side just to break things up. You don't have to do it that way though. The 36 squares are 6" squares and the edge is 7" strips (2 are 31", 2 are 36.5"). You really need 72 squares total (36 Minkee, 36 Cotton). All of the seams are 1/2". Once all the squares are sewn you fold the border strips in half (right side out) and sew it to the edge of the quilt, smaller two first, then the larger two. Sew around the edge of the border to finish it off neatly. Then get to cutting! 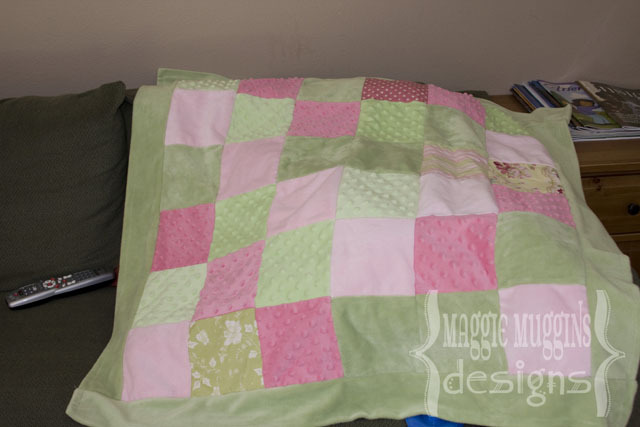 I've made one rag quilt before and was planning on making another one. I wanted to use minkee, so I'm glad to see that it does actually work. ha ha the scared feeling you get about having a girl is the feeling I get about a boy!! I'm terrified of having a boy!! I only know girls!! ha ha I MISS YOU TONS!! I'm off to sew the first summer dresses of the season! Love ya! 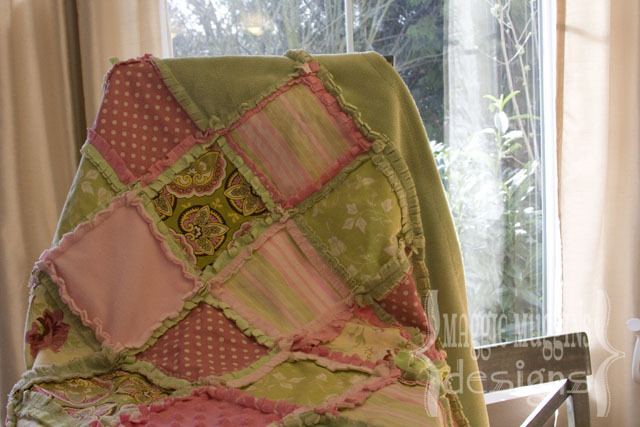 I adore rag quilts! This is gorgeous - lovely colors! 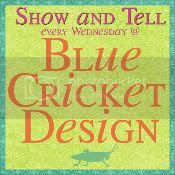 Would love to have you stop by the Sunday Showcase Party. Hope you are enjoying your weekend! You did a fantastic job - so pretty! Cute blog Maggie. And darling blanket. I love it! I just adore this quilt. I would love to know all different kinds of fabrics you had used. Tha;nk you so much! 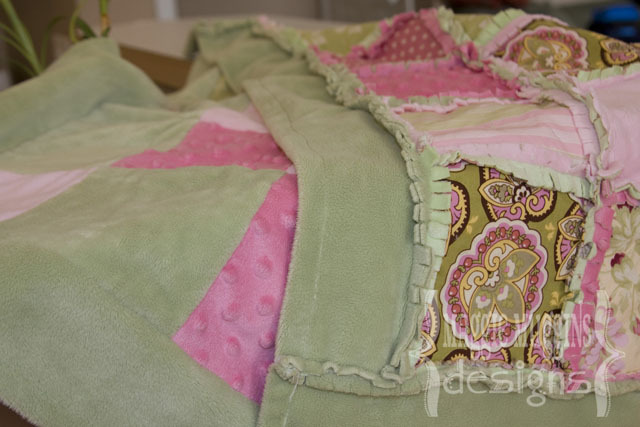 The main fabric I chose was "Amy Butler Lotus Damask Rose Star Paisley Lime". The rest were just fabrics I found in a local store that went with it. I'm not sure what company they were now. It's been a few years. Sorry!